I took my kids on a nature walk today up the canyon. We were having a really good time collecting rocks, caterpillars and leaves until Asher found the biggest leaf he'd ever seen and asked me to reach into the bush to get it. I had Abe on my back in a hiking backpack and so I bent down awkwardly to pull the leaf. As I started to come back up I realized that my hair was stuck and I couldn't move my head a single inch. I thought that maybe Abe had grabbed my hair and wasn't letting go, but it turned out that I had snagged my ponytail in a whole bunch of cockle burrs and I was stuck... really stuck. I pulled and I pulled but I couldn't get my hair untangled. After about five minutes I was considering calling a friend to come up and cut me out when, with one final effort, I took both my hands and pried my head off of the bush. I left behind a real nice brown nest for some lucky birds this spring. After getting out of the bush I had a head full of burrs and Asher and Rose thought it was really funny. 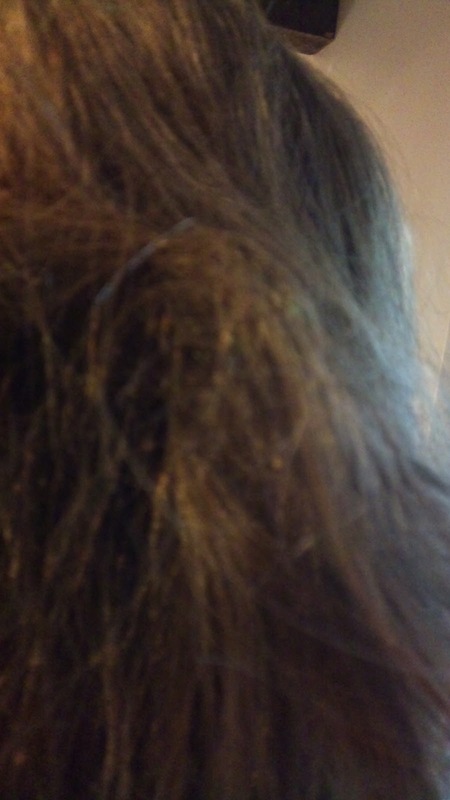 Asher kindly tried to yank some of the burrs out of my hair... ouch! 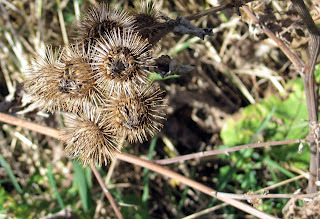 I have never had many burrs (at least 20) tangled that badly before in anything! I tried my best to pull out as many as I could but wow, they hurt... and each one took a big wad of my hair with it. Finally I loaded up the kids in the car and told them we were going to go get our hair cut. I called one of my best friends from high school, who happens to be a fantastic hair dresser, and when she heard my story she burst out laughing and told me to come over right away. On the way there Rose decided that she wanted to get her hair cut too. I was really excited about this because that little girl won't let me lay a finger on her hair. She insists on doing it herself (unless I can bribe her) and so usually her hair is a wild mess. I have been gently trying to suggest to her that we could cut her hair, so that it wasn't so mess, but she just told me that she likes messy hair. So I was thrilled when she suggested a hair cut! When I got to my friend's house she just laughed and said that she might be able to wash and brush the burrs out-- but that just sounded really painful to me-- so I told her to just cut all my hair off. I was pretty tired of it anyway and thought that now was as good a time as any for a big change. I am really laid back about my hair and so I didn't really care what she did to it.... I just wanted the burrs out! She had to cut it short (and in an A-line) because the burrs were high up on my head. I wasn't planning on short hair anytime soon but I actually really love it. It makes me feel like a burden has been lifted and I really like that. Rose got her hair cut right after I did and it was so cute to see how intent she was on not wiggling. 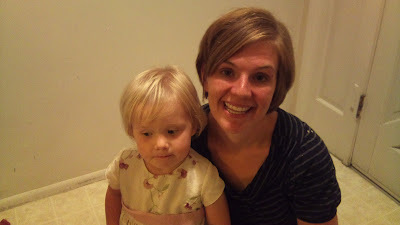 Her hair cut turned out cute and she loves it that now we have matching hair. Her very first hair cut! Mostly I am just really proud of myself because I didn't get frustrated and was able to laugh about it the whole time... except maybe for the "tearing my head out of the bush" part. I won't lie... that really hurt. What is your most memorable hair experience? You both look adorable! 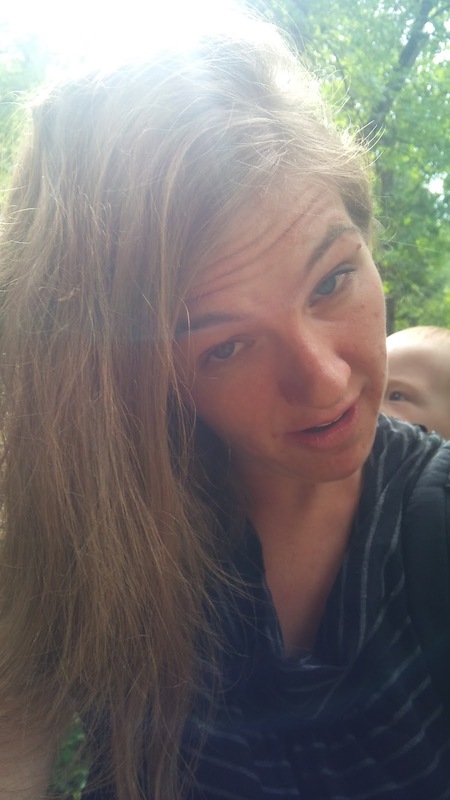 Last week my two year old was combing my hair. She got down and said, "I forgot something!" She ran away, came back, climbed up behind me and started combing again. Then she said, "Now I give you a haircut." I whipped around just before she tried to hack my hair off! It was so close. I can laugh about it now but then I just set her down and said, "No way, Jose! Scissors are only for mom to use!" Ouch! Isn't life so very odd? Haha. I am loving the new haircuts! And, ohmygoodness, I recognize that shirt! X) It looks so great on you!! Most memorable hair experience. . . . When I was twelve, I decided to be very impatient, and instead of waiting for a time when my mother could cut my hair, I did it myself. I ended up chopping my bangs off until they were about an inch long. Back in those days, I wore big huge barrettes in my hair, so once my bangs were nearly gone, I had barrettes snapped onto the middle of my head. . . . Not very attractive. The ironic thing is that I had bragged to a cute boy in my class about how good I was at cutting hair - I meant my dad's - and I was wanting my hair cut for the sole purpose of impressing this boy. He did comment on it once, asking me why I was wearing my bow up so close to my part. >.< Funniest thing of all, I'm still good friends with this boy, and every time I see him, I remember his incredulous look and my bright red face . . . and he probably forgot about it long ago. . . . It looks so cute! I once had braid extensions put into my hair. That was fun. but annoying to wash, and i never felt like my hair was really clean. But it was cool to feel a little funky for a bit. I Love you new haircut. It is so flattering and stylish. I haven't ever done anything super drastic to my hair, partly because my mom always hyperventilated at the thought of me dying it or whatnot. "Once you start, you can't stop!" has echoed through my mind ever since I was a teen. 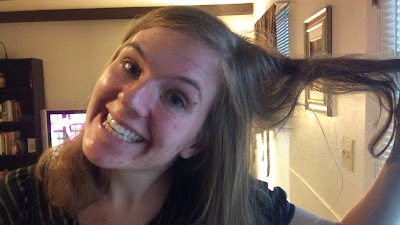 I tried to give myself Hermione Hair when my husband and I went to see the last Harry Potter movie. (I'm a bit of a nerd that way). The whole experience ended with him cutting the inextricable velcro curlers out of my hair. It was pretty embarrassing to have to tell the hairstylist the next day! SO cute! What an eventful day. Because of all the swimming I could never grow my hair long. The chlorine just melted it. So I think my mom felt bad for me and when I was in elementary school, my mom LET me have a tail...you remember those like a rat tail thing. Somehow it made me feel better about not being able to have all of my hair long. My aunt who is an amazing hairdresser I think "accidentally" cut it out. I wasn't angry when she did. I guess I had grown tired of it. Your new 'do looks really cute! 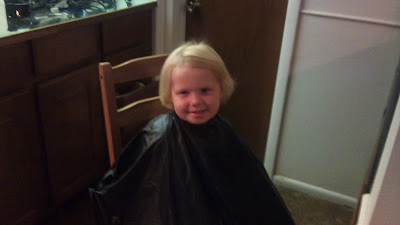 And hooray for getting the little one to cooperate with a new cut too. My hair story involves me being really depressed and deciding to take it out on my hair. I guess I had this desperate need to act out in some way and that's what I tended to do. So, I cut off my looong hair right up next to my head! My aunt fixed it into a cute pixie cut and it actually turned out great in the end. During the first year I was married I buzzed it ALL off though. I'm sure I got weird looks for a long time on that one. I do have a lovely shaped head though! When I had cancer I was bald and figured at least I didn't have a cone head, so it wasn't so bad. 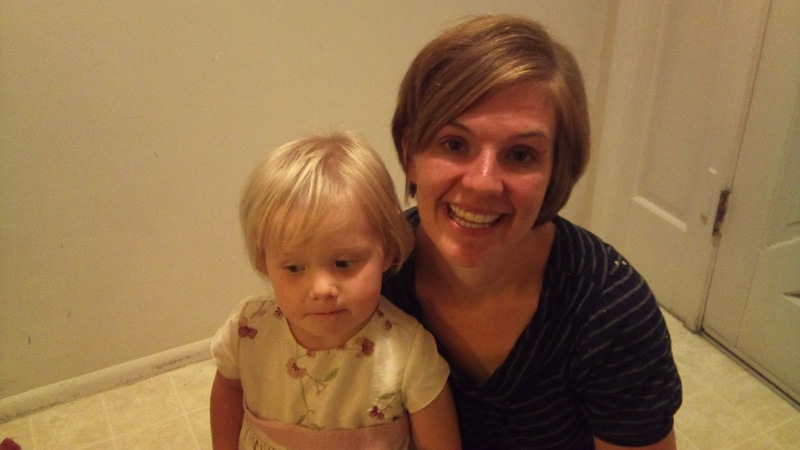 What a great story - and both new haircuts look great! I love your new haircut! That hairstyle looks so nice on you! It's a perfect frame for your face. Once when I was a young teenager I was babysitting my sister's children. My hair was really long and my niece wanted to play hair stylist. She ended up using a round, natural bristle brush like a roller, and it wouldn't come out. 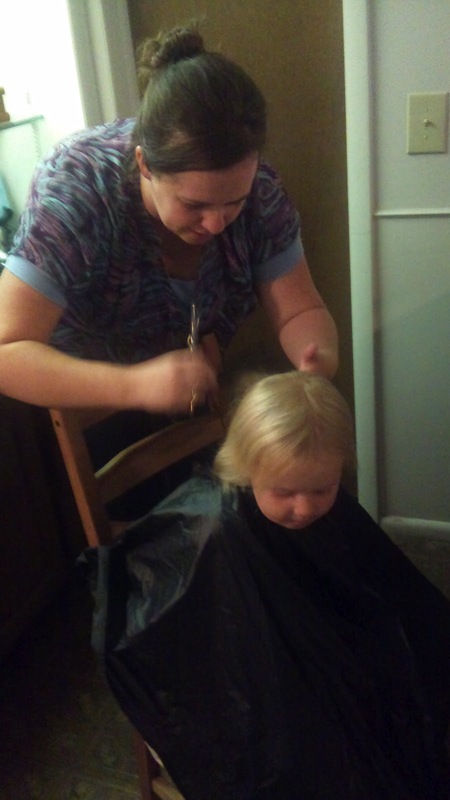 Thankfully, when her parents came home, my brother-in-law had the patience to sit there and unwind one little tiny section of hair at a time until it was all freed from the brush, so I didn't have to cut it out. Well, in the area of hair disasters, I tried dying my hair reddish with a temp dye that never fully washed out. It was supposed to be 25 washes or something, and I was still getting comments six months later. I can now admit that it was absolutely the worst idea ever, and turned out horrendous. On the other hand, right before my prom, I decided to chop my hair off (I actually went to someone and had them cut it, but it's more fun to say that way. They thought I was crazy for doing that before prom with no idea how it would work.) It was probably about how long yours is now, and I straightened it. My date had really long curly hair, so it was perfect. I guess I've been blessed to see both sides of hair experiences. I love your hair!, you look great! that friend is a really good hairdresser!